QuestionHow and why did you decide to enroll at Illinois Central College? I first started going to ICC way back in 2001 when I graduated from high school. At the time, I didn’t take school seriously and didn’t finish at the time. Over the years, I attended ICC here and there but was never able to finish. After my mom passed away in 2010 I knew I wanted to get into health care, but still wasn’t sure what I wanted to do. 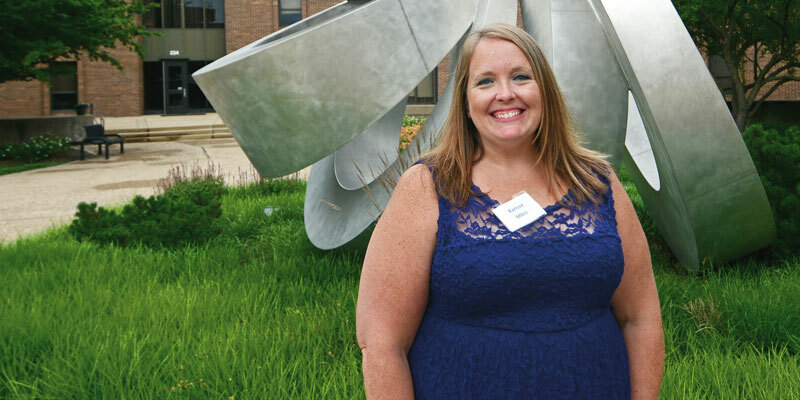 I got a job on Labor and Delivery at OSF Saint Francis Medical Center and knew what I was meant to do — I wanted to be a nurse. In the fall of 2017 I enrolled back into ICC and knew I was going to finish this time so that I could enroll in nursing school at Saint Francis College of Nursing. QuestionBefore and during your time at ICC, you have experienced loss but also the joy of life by raising three girls. What was your motivation for pulling through and re-enrolling at ICC? My three beautiful girls have been my No. 1 motivators through my schooling. When I feel like I’m not spending enough time with them I remind myself that I am creating a future for us and this time will soon be a distant memory, with much less stressful times to come. They have also been my cheerleaders through it all. There is nothing like the excitement on their faces when they ask how I did on a test or what I did in school that day. QuestionWhat were your initial hopes or expectations of ICC? I started this journey not knowing what to expect. I knew it would be hard and I hoped to have a good support system between my classmates and my instructors at ICC. QuestionWhat about ICC have you found to be the most helpful on your path to earning a college degree? The Educational Foundation has been the biggest help to me on this path. Without the generosity of the community and the help that students receive from the Educational Foundation, many people, myself included, wouldn’t be able to continue their education. Some of the professors I have had at ICC have been nothing short of amazing helping me in my journey as well. Pradeepa David, my chemistry teacher, is one who deserves particular recognition. She makes sure that her students succeed and is willing to help in any way she can. She helped me understand (and even like) chemistry by the end of my class with her. QuestionWhat would you recommend to others, who may not be a traditional student, to find success at ICC? For any other students, I would first recommend finishing school right out of high school, it is so much easier to go to school without kids! However, if you find yourself in the position where that opportunity is missed, my main suggestion is to keep going. Don’t give up. It will be hard and you will want to give up but the reward will be so great at the end when you are able to give your family a better life. Find other people at ICC who are non-traditional students or who are in the same situation as you, they can help give you the support you need. To learn more about the nursing programs and other health careers at ICC, visit the Health Careers department or call (309) 690-7530.